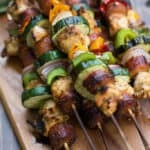 Grilled Cajun Chicken and Sausage Kebabs are packed with vegetables bold and spicy cajun flavors. I have wanted to share these Cajun Chicken and Sausage Kebabs for a while, but honestly I just never get around to taking photos of them before we eat. I’m always too anxious to eat them hot and fresh off the grill. So, I finally managed to snap two photos of them before we ate them last week. The pictures hardly do them justice–they’re the BEST! You just can’t go wrong with grilled chicken, sausage, veggies and homemade cajun seasoning. My husband declares these his favorite kebabs I’ve ever made. That’s saying a lot considering how often we eat kebabs! The flavor of these are amazing! We like spice, especially when it comes to cajun food! If you don’t like spicy food I would cut down on the cayenne pepper, or just leave it out. 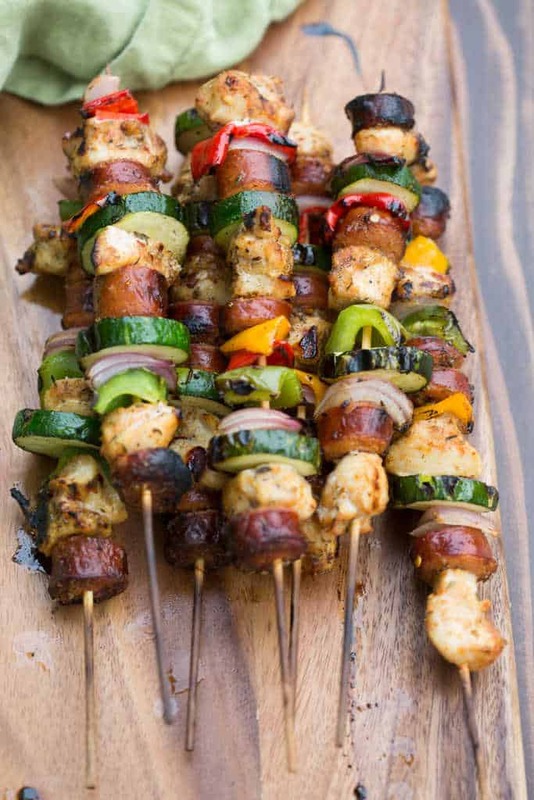 Grilled Cajun Chicken and Sausage Kebabs are packed with bold and spicy cajun flavors. Prepare the cajun seasoning by combining all ingredients in a small bowl. Soak wooden skewers in water while you make the cajun seasoning. (Soaking them in water helps prevent them from burning on the grill). Add sausages to mixing bowl. Drizzle with olive oil and half of the cajun seasoning. Toss to coat. Season the cut chicken with remaining cajun seasoning. 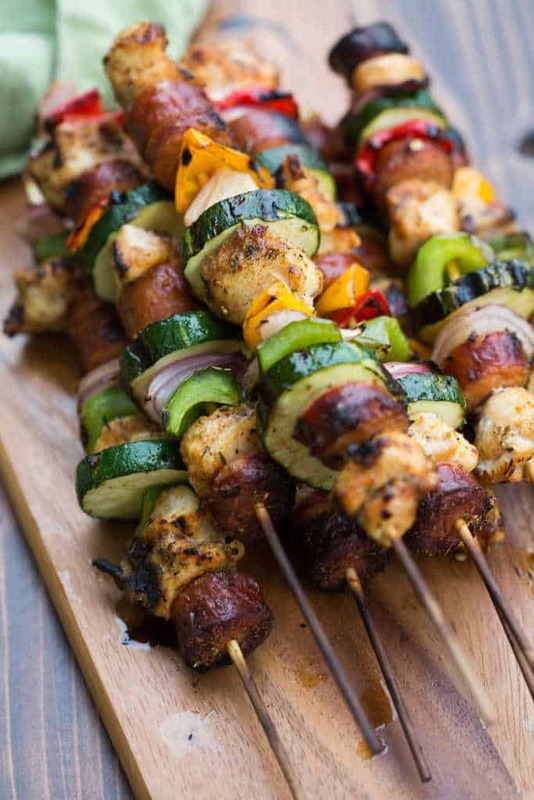 Layer skewers alternating with pieces of chicken, sausage, and chopped vegetables. You can pack them together closely. Place prepared kebabs on hot grill. Cook for a few minutes on each side, gently rotating them 2 or 3 times as they cook, until the chicken is cooked through. Remove to a plate. Serve immediately. This is one of my favorite meals for the grill! We love Cajun spices! Is there anyway we could adapt this to make it on the stove or in the oven? Each serving is estimated to contain 2 carbohydrates, 8 grams of protein, and 7 grams of total fat. There are 113 calories per serving and 15 kebabs is the serving size! You can find this info in the nutrition label below the recipe :).